This is my review of the Aquadoodle Mat by Tomy which I purchased from Amazon. It was my son’s third birthday on Friday and usually on their birthdays I get them both some presents so neither of them feels left out, and then I get a couple of shared gifts for all of us to do together. One of the shared gifts was an Tomy Aquadoodle, the classic colour edition. 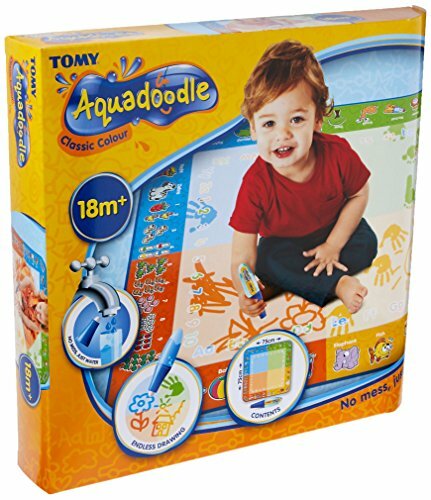 Aquadoodle is a mat that comes in many sizes, styles, themes and colours and allows children from the age of 18 months and up to have hours of fun drawing with absolutely no mess. You fill the Aquadoodle pen with water and simply begin drawing on the Aquadoodle mat. Unlike paper, it provides infinite use as the drawings fade away and disappear as the water dries up allowing kids to draw, colour and trace at home, school or while travelling. I got the Classic Colour Aquadoodle by Tomy for £18.15 from Amazon, it was on sale from £22.99 (£4.84 saving) and had a lot of fantastic 5-star reviews so I had to get it for my kids to try. The kids looked really excited when they first saw the Aquadoodle box and upon opening it I was surprised at just how large the mat is. My daughter is 4 so I thought it might be too small for her, but it’s actually perfect. The mat is 75cm by 75cm so great for kids of pretty much any ages. The mat is comprised of four squares, each offering a different colour when drawn on with the Aquadoodle pen. Around the edges there are shapes and numbers to trace and colour in. And then the border contains fun and colourful pictures for kids to copy. You can see Marty colouring in the numbers around the edge with them appearing in different colours. I drew the other things you can see and he made me fill them in, haha. You can see the four colours from each square, too – blue, green, orange and yellow. The kids had, and continue to have, so much fun with their Aquadoodle. It’s a fantastic activity and drawing toy and I can happily say that after watching them, and after trying it out myself, it was an awesome buy and I couldn’t recommend it enough to other parents. It’s great. You can buy the Aquadoodle we got here. It’s only provided with one pen so it may be better to have more if your kids want to draw at the same time. You can buy more pens here. Oh, and one more thing, if you’d prefer a themed Aquadoodle. They have them available. For kids who love Peppa Pig, there’s a Peppa Pig Aquadoodle which you can find here. A Paw Patrol Aquadoodle here, and even a Thomas & Friends Aquadoodle here. There are other themes available, too, so whatever your kids are into you can be sure that an extra big smile is brought to their faces by drawing with and around their favourite characters. Each one includes different activities, colours and stuff. The Thomas Aquadoodle, for example, comes with a small Thomas the Tank Engine train you can roll across the mat to make train tracks. I think it’s worth noting that the themed Aquadoodles have smaller mat sizes. My kids and I love the Tomy Aquadoodle mat. Thumbs up from us!